Learn more about your website visitors. Alexa rank. Alexa rank is a global website rank by the reputable analytical service http://www.alexa.com mainly based on the combination of the estimated average daily unique visitors to the site and the estimated number of pageviews on the site over the past 3 months. The site with the highest combination of unique visitors and pageviews is ranked #1. There should be mentioned that Alexa rank is estimated for top level domains only (e.g., domain.com). Alexa does not provide separate rankings for subpages within a domain (e.g., http://www.domain.com/subpage.html) or subdomains (e.g., subdomain.domain.com) unless Alexa is able to automatically identify them as personal home pages or blogs, like those hosted on sites like Blogger (blogspot.com). If a site is identified as a personal home page or blog, it will have its own Traffic Rank, separate from its host domain. Bounce rate. Bounce rate is the percentage of users who leave a site without visiting any other pages or who only view a single page on this site per session. Daily pageviews per visitor. Daily pageviews per visitor are the estimated number of unique pageviews per one visitor on a website; it is one of the most important factors in determining the success of a site and its popularity among the users. Daily time on site. Daily time on site is the estimated amount of time in minutes and seconds visitors have spent on a site. Visitors localization. 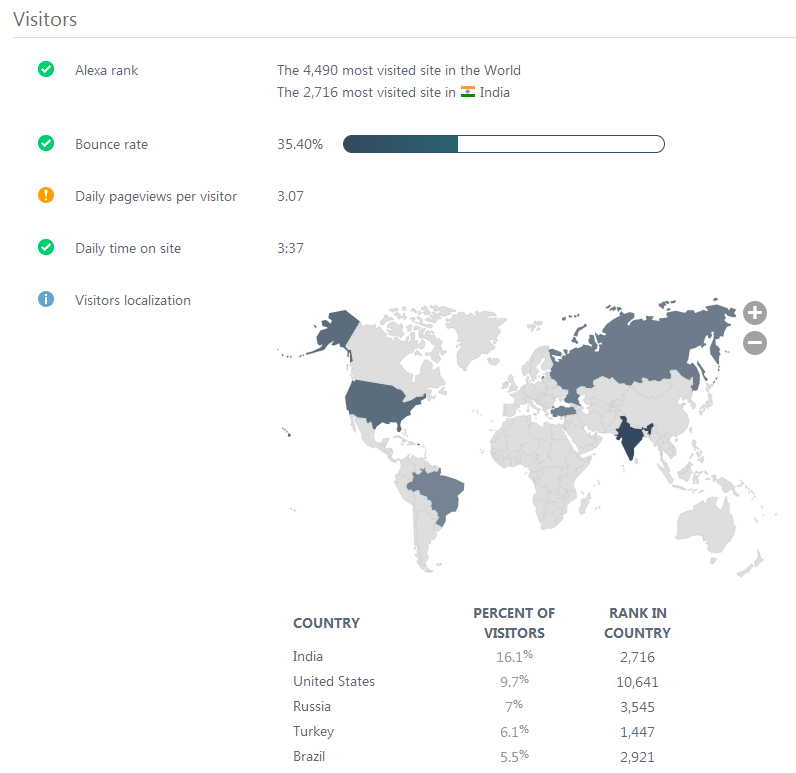 Visitors localization is the geography of the website audience expressed as a percentage of total number of users. Look at the map to see what countries and regions visit your web resource the most. Under the map you can see the list of countries where your website is popular: the percentage of visitors and rank in country. Learn more about each criterion by clicking its header. Semalt provides recommendations on how to increase this criterion value. Click the link About this criterion for more details.